Plans to extend Fred. Olsen House in Ipswich, Suffolk, to create one central headquarters for staff at Fred. Olsen Ltd, Fred. Olsen Cruise Lines and Fred. Olsen Travel have been granted planning permission, with work set to be underway by April. The extension will more than double the size of the existing Fred. Olsen House, in White House Road, Ipswich, increasing the building size from 14,000 sq ft to 32,000 sq ft, and allowing employees of all Fred. Olsen companies based in the Whitehouse area of Ipswich to work from the same base. Currently, Fred. Olsen Ltd is based temporarily in Dencora Business Centre; Fred. 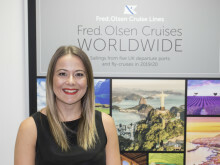 Olsen Cruise Lines is based at Fred. Olsen House and Fred. Olsen Travel is located in Olympus Close. The extension will be a three-storey building, incorporating open-plan office space with breakout areas and meeting rooms, with planning permission granted by Ipswich Borough Council. In addition, Fred. Olsen has also purchased land to the rear of the extension site for the creation of additional staff parking areas, which is set to increase parking provision for all three companies by around 50%. “The Directors of Fred. Olsen Ltd, Fred. Olsen Cruise Lines Ltd and Fred. Olsen Travel Ltd are delighted to announce that, having received planning permission for the office extension, they have now entered into an agreement to buy the land and construct the office with Artisan Developments. This extension will more than double the space at Fred. Olsen House, from 14,500 sq ft today to 32,000 sq ft. Enabling works are set to start within the next two weeks, ahead of foundation preparation work getting underway in late April. The building is scheduled to be completed in the Summer of 2020 and work on the refurbishment of the existing building will commence thereafter, with final completion due by the end of the year.